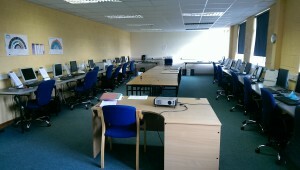 Enniscorthy Enterprise Center boasts a large, fully equipped computer room, where we run successful computer training courses. This is a full-time training programme run by Enniscorthy Enterprise Centre, funded by SOLAS and Wexford & Waterford ETB. The programme is aimed at students primarily under 35 years of age that do not hold a level 5 Major Award. The students will gain an award that is recongnised by employers, with an emphasis on subjects that will give the multi-skills required by local businesses. The centre runs private computer training courses in the evening. These computer training courses can be tailored to suit the needs of any individual company, specific to the company. At Enniscorthy Enterprise and Technology Centre we provide a very adequate computer room, fully equipped with up to date computers. Mary Kinsella, LTI manager on 053-9237499.